As a lad of 11, Rob moved to a warm and sunny place near the sea in Florida. Learning the ancient art of riding a surfboard became a lifelong pursuit. Much later Rob discovered the lively art of Waldorf Education integrating the arts and academics. He became a teacher, husband, father and camp director and continues to tutor all ages and care for children through his wife Tracey's Lifeways Program. Orca started our saltwater celebration 24 summers ago on the warmth of extended family, learning through play and nature immersion. The practice of "all my relations" is at the heart of our camp and we share gratitude for earth, sea and sky. I just graduated at the Anacapa School, and I started going to Orca camp when I was 5. I love all things in nature, especially the ocean, and I attribute this passion to all my days at orca school and orca camp. I also love seeing children smile, laugh, learn, and grow. I spend my school year babysitting, volunteering at the library's homework help program, working at a swim school, and being a cabin leader at outdoor schools for local 6th graders. I love that orca camp combines my love of the ocean and my passion for helping children. I love surfing, kayaking, and body surfing in the waves, with the children and the Dolphins. And I'll never give up the opportunity to make a drip castle, friendship bracelet, play the ukulele, or take a trip to the tide pools. Noah is a student at Westmont College studying Kinesiology. Noah enjoys many outdoor adventures and works as a rock climbing instructor when time permits. He is popular with our campers with his calm, steady enthusiasm, laughter and readiness to help. Hi my name is Olivia (I go by Ozie) and I have loved being a counselor at Orca camp for the past 3 years! I am from Santa Barbara and currently am a junior studying biology at Pepperdine University in Malibu. I was lucky enough to be a camper at Orca Camp where I learned how to surf and kayak, and I have loved ocean activities ever since. My favorite part about the ocean is all the amazing sea creatures that live in it and my life dream is to become a marine biologist. I am so excited to help with Orca Camp again this summer and I look forward to some great adventures, meeting all you new campers and catching up with the returners! 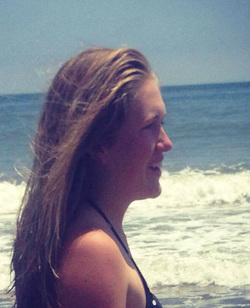 Siena is a student at Santa Barbara High School and enjoys beach volleyball as much as possible. She's been a counselor with Orca for a few summers now, helps with surfing, kayaking, sandcastles, ukulele and friendship bracelets.